Recipes and ideas for all seasons and a simpler time: Cynthia O’Hara presents incredibly user-friendly projects and dishes that make replicating her flavors and designs as natural as the changing of the seasons. 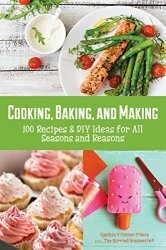 The Harried Housewife has written articles and developed a wide variety of recipes that reflect a simpler time and are ideal for budget-conscious families. The "Harried Housewife's Recipe Box" column is syndicated nationally in regional newspapers.